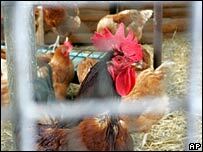 Sweden has become the latest European country to report a case of bird flu. The country's National Veterinary Institute said the virus was found on a duck in Eskilstuna, west of the capital, Stockholm. Additional tests were being carried out to determine what strain was involved, the NVI said in a statement. In Europe, the deadly H5N1 strain that has killed more than 60 people in Asia has been found in Romania, Turkey and Russia and is suspected in Greece. Tests are being carries out in the UK to see whether a parrot that died while in British quarantine had the H5N1 strain. Samples from Croatia and Macedonia are also being tested. The UK government called for a ban on wild bird imports to the European Union after the incidence of the disease in its territory. Environment Minister Ben Bradshaw said the ban could be introduced within days. Experts fear a bird flu pandemic if it mutates to spread easily among humans. A seven-year-old boy in Thailand tested positive for bird flu on Friday, two days after his father died from the disease. But Siriraj Hospital stressed they did not believe the boy, who is recovering, had caught the virus from his father. Taiwan has responded to bird flu fears by starting work on its own version of the anti-viral drug, Tamiflu, without waiting for the manufacturer's consent.